MOC7811 is a slotted Opto isolator module, with an IR transmitter & a photodiode mounted on it. Performs Non-Contact Object Sensing. This is normally used as positional sensor switch (limit switch) or as Position Encoder sensors used to find position of the wheel. 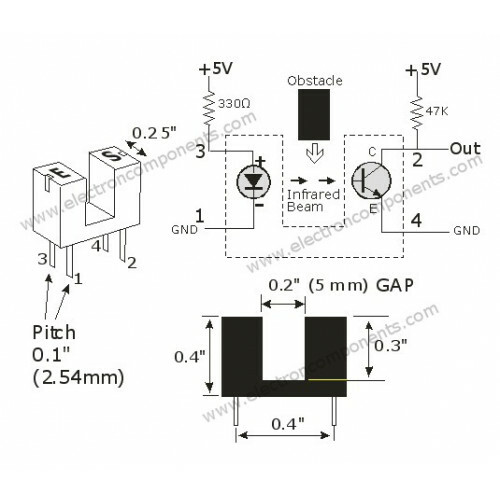 It consists of IR LED and Photodiode mounted facing each other enclosed in plastic body. When light emited by the IR LED is blocked because of alternating slots of the encoder disc logic level of the photo diode changes. This change in the logic level can be sensed by the microcontroller or by discrete hardware. This sensor is used to give position feedback to the robot or as Limit switches.